This recently constructed 9,570 sq. ft. house at 2 Mary's Way is the largest in Truro. It is situated on 1.72 acres and is part of a multi-residence vacation complex. 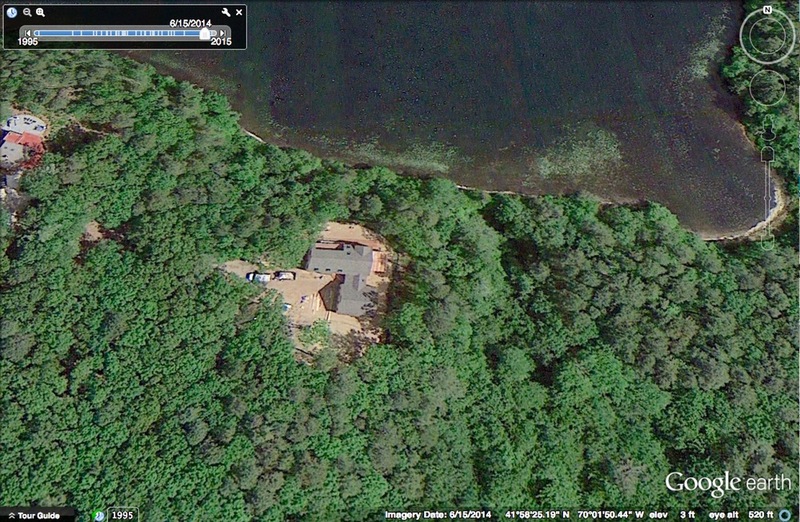 It sleeps 22 people, and has a home theater, 7 bedrooms and 8 bathrooms, and full outdoor recreation complex. Although it is not in the Seashore District, it is houses of this scale that the proposed bylaw seeks to prevent in the Cape Cod National Seashore. There are 132 residential properties in the Seashore District that are 1.72 acres or larger that could accommodate a similarly sized house with a tennis court, swimming pool, and multi-car garage. Market forces are eroding the district’s character. Since the year 2000, 42 houses, representing 20% of the Seashore District properties, were built or enlarged, with 10 in the 4,000-5,000 sq. ft. range. As developable property elsewhere becomes scarce, the small historic houses and cottages in the Seashore District, surrounded by acres of open space, are at risk for teardowns. 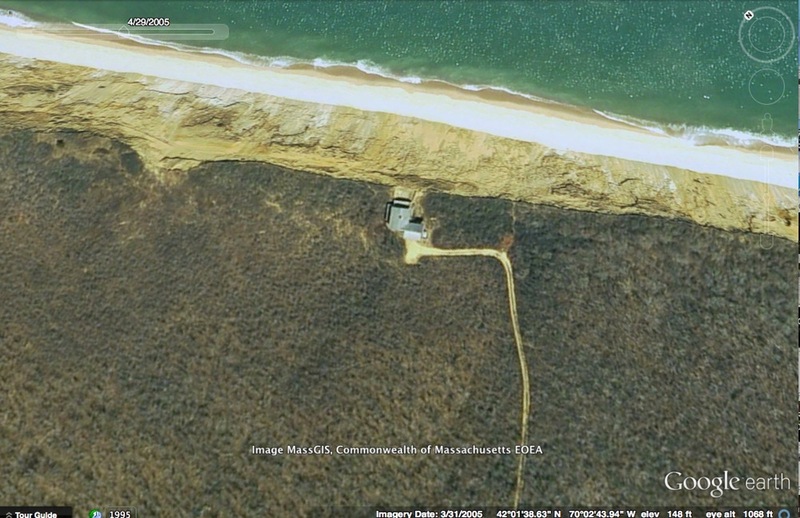 Click on the above image of a former cottage tucked in the woods on Great Pond, Truro (and continue to click on each of the following images) to observe the types of changes that are happening in the Cape Cod National Seashore. Cottages are being replaced with much larger houses. 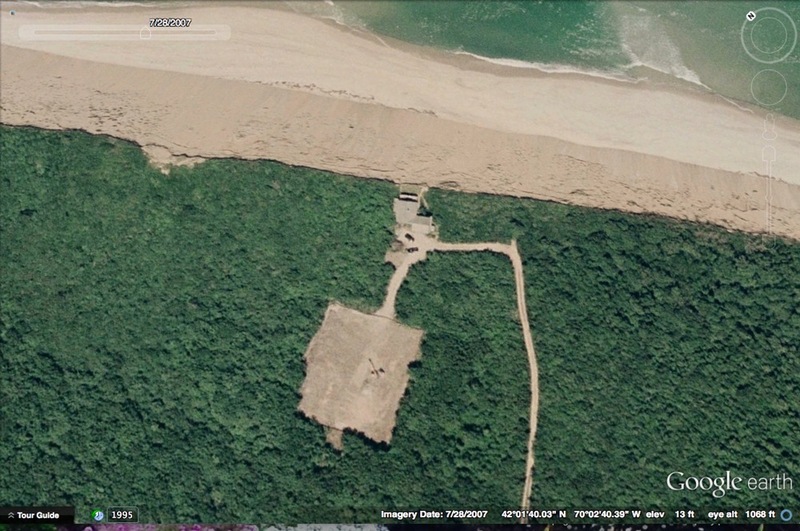 Where the beach erosion is taking its toll, replacement houses are much bigger. A growing concern are the unprotected campgrounds with new out-of-state ownership that are starting to be changed from primitive wooded campsites to RV Parks with water, electric, sewer and cable TV hookups. Horton's Campground is being converted from wooded primitive tent sites into an RV Park with hookups for electric, water, sewer, and cable TV.